New Zealand is a representative democracy. Members of the unicameral New Zealand Parliament gain their seats through nationwide general elections, or in by-elections. General elections are usually held every three years; they may be held at an earlier date (a "snap" election) at the discretion of the Prime Minister (advising the Governor-General), although it usually only happens in the event of a vote of no confidence or other exceptional circumstances. A by-election is held to fill a vacancy arising during a parliamentary term. The most recent general election took place on 23 September 2017. New Zealand has a multi-party system due to proportional representation. No party has won an outright majority since the introduction of proportional representation. The introduction of the mixed-member proportional (MMP) voting system in 1993 was the most significant change to the electoral system in the 20th century. The Electoral Commission is responsible for the administration of parliamentary elections. Local government politicians, including mayors, councillors and District Health Boards are voted in during the local elections, held every three years. These elections used both single transferable vote (STV) and first past the post (FPP) systems in 2007. The first national elections in New Zealand took place in 1853, the year after the British government passed the New Zealand Constitution Act 1852. Women's suffrage was introduced in 1893, with New Zealand being the first modern country to do so. Initially, New Zealand used the first-past-the-post electoral system. The first election under the mixed-member proportional (MMP) system was held in 1996 following the 1993 electoral referendum. The electoral roll consists of a register of all enrolled voters, organised (primarily alphabetically by surname) within electorates. All persons who meet the requirements for voting must by law register on the electoral roll, even if they do not intend to vote. Although eligible voters must be enrolled, voting in New Zealand elections is not compulsory. The Registrar of Births Deaths and Marriages automatically notifies a person's death to the Electoral Commission so they may be removed from the roll. Enrolment update drives are conducted prior to every local and general election in order to keep the roll up to date, identifying any voters who have failed to update their address or cannot be found. The roll records the name, address and stated occupation of all voters, although individual electors can apply for "unpublished" status on the roll in special circumstances, such as when having their details printed in the electoral roll could threaten their personal safety. The roll is "public information" meaning it can be used for legitimate purposes such as selecting people for jury service but it can be abused especially by marketing companies who use the electoral roll to send registered voters unsolicited advertising mail. According to Elections New Zealand, "having the printed electoral rolls available for the public to view is a part of the open democratic process of New Zealand". The Electoral Commission, in their report on the 2017 General Election recommended that roll sales be discontinued. for anything other than electoral purposes. New Zealanders refer to voting districts as "electorates", or as "seats". Following the work of the 2014 Representation Commission review, New Zealand from 2014 on[update] will have 71 geographical electorates. The Commission moved boundaries in west Auckland to abolish the Waitakere electorate and establish the new electorates of Upper Harbour and Kelston. The 71 electorates include 7 Māori electorates specially set up for people of Māori ethnicity or ancestry who choose to place themselves on a separate electoral roll. All electorates have roughly the same number of people in them – the Representation Commission periodically reviews and alters electorate boundaries to preserve this approximate balance. The number of people per electorate depends on the population of the South Island – this, currently[update] the less populous of the country's two main islands, has sixteen guaranteed electorates, so the ideal number of people per electorate equals the population of the South Island divided by sixteen. From this, the Commission determines the number of North Island, Māori and list seats, which may fluctuate accordingly. Tradition associates elections with November – give or take a few weeks. After disruptions to the 36-month cycle, Prime Ministers tend to strive to restore it to a November base. In 1950, the legal requirement to hold elections on a Saturday was introduced, and this first applied to the 1951 election. Beginning with the 1957 election, a convention was formed to hold general elections on the last Saturday of November. This convention was upset by Robert Muldoon calling a snap election in 1984. It took until the 1999 election to get back towards the convention, only for Helen Clark to call an early election in 2002. By the 2011 election, the conventional "last Saturday of November" was achieved again. However, the convention was broken again for the 2014 and 2017 elections, which both occurred on the second-to-last Saturday in September. Unlike general elections, elections for the city, district and regional councils of New Zealand have a fixed election date. Under section 10 of the Local Electoral Act 2001, elections must be held on the "second Saturday in October in every third year" from the date the Act came into effect in 2001. The last local body elections were held on 8 October 2016. The next will be held on 12 October 2019. New Zealand general elections occur when the Prime Minister requests a dissolution of Parliament and therefore a general election. Theoretically, this can happen at any time, although a convention exists whereby Prime Ministers do not call early elections unless they have no reasonable alternative. The maximum time allowed between two general elections is slightly more than three years. Advance voting is available in the two weeks before election day. A dominating feature of the 2017 General Election was the increased use of advance voting. 47% of the votes were taken in advance and grew from 24% in the 2014 election. In earlier elections, voters were required to provide reasons to vote in advance. From 2011 and beyond, voters could use this service for any reason. The Northcote by-election in 2018 was the first parliamentary election where more people voted in advance than on election day. If voters cannot physically get to a polling place, they may authorise another person to collect their ballot for them. Overseas voters may vote by mail, fax, internet or in person at NZ embassies. Disabled voters can choose to vote via a telephone dictation service. New Zealand has a strictly enforced election silence; campaigning is prohibited on election day. All election advertisements must be removed or covered by midnight on the night before the election. Opinion polling is also illegal on election day. Each voter gets a party vote, where they choose a political party, and an electorate vote, where they vote for a candidate in their electorate. The party vote determines the proportion of seats assigned to each party in Parliament. Each elected candidate gets a seat, and the remaining seats are filled by the party from its party list. A party wins 30% of the party vote. Therefore, it will get 30% of the 120 seats in Parliament (roughly 36 seats). The party won 20 electorates through the electorate vote. Therefore, 20 of the 36 seats will be taken by the MPs that won their electorate, and 16 seats will be left over for the party to fill from their list of politicians. Polling places close at 7.00pm on election day and each polling place counts the votes cast there. The process of counting the votes by hand begins with advance and early votes from 9:00am. From 7.00pm, results (at this stage provisional ones) go to a central office in Wellington, for announcement as they arrive. Starting from 2002, a dedicated official website, "www.electionresults.govt.nz" has provided "live" election result updates. The provisional results from polling places and advance votes will generally become available from 7:30pm, with advance vote results usually released by 8:30pm and all results by midnight. All voting papers, counterfoils and electoral rolls are returned to the respective electorate's returning officer for a mandatory recount. A master roll is compiled from the booth rolls to ensure no voter has voted more than once. Special and overseas votes are also included at this stage. The final count is usually completed in two weeks, occasionally producing surprise upsets. In 1999 the provisional result indicated that neither the Greens nor New Zealand First would qualify for Parliament, but both parties qualified on the strength of special votes, and the major parties ended up with fewer list seats than expected. The final results of the election become official when confirmed by the Chief Electoral Officer. Candidates and parties have 3 working days after the release of the official results to apply for a judicial recount, either of individual electorates or of all electorates (a nationwide recount). A judicial recount takes place under the auspices of a District Court judge; a nationwide recount must take place under the auspices of the Chief District Court Judge. At the 2011 election, recounts were requested in the Waitakere and Christchurch Central electorates, after the top two candidates in each were separated by less than 50 votes. Referenda by mail are scanned into a computer system, but not counted until the close of polling. When the poll closes at 7.00pm, the scanned ballots are counted and the results announced soon after. The following table lists all previous[update] general elections held in New Zealand (note that elections for Māori seats initially took place at different times from elections for general seats). The table displays the dates of the elections, the officially recorded voter turnout, and the number of seats in Parliament at the time. On the right the table shows the number of seats won by the four most dominant parties in New Zealand's history (the Liberal Party and the Reform Party, which later merged to form the National Party, and the Labour Party), as well as the number won by other candidates (either independents or members of smaller political parties). ^ The Liberal Party lost their majority in the 1911 election; however, due to the lack of a majority, they were able to stay in power until a vote of no confidence resulted in the formation of the Reform Government in 1912. ^ a b c d The United Party (a regrouping of the Liberals) and the Reform Party contested the 1931 and 1935 elections as a coalition, but did not formally merge as the National Party until 1936. ^ Due to major problems with the enrolment process, commentators generally consider that the 1978 election had a significantly higher turnout than official figures indicate. Ten referendums have been held so far. Seven were government-led, and three were indicative citizen "initiatives". As shown in the table above, voter turnout has generally declined in New Zealand general elections since the mid-20th century. Concerns about declining democratic engagement and participation have been raised by the Electoral Commission, and by commentators such as Sir Geoffrey Palmer and Andrew Butler, leading some to support the introduction of compulsory voting, as exists in Australia. A system of compulsory voting looks unlikely to manifest in the near future with Prime Minister Jacinda Ardern arguing that it is an ineffective way to foster citizen engagement. Turnout has been in decline in most developed democracies over the last 30 years, but New Zealand's decline has been particularly steep and persistent. At the 2011 election, turnout as a percentage of those eligible to enrol dropped to 69.57 per cent, the lowest recorded at a New Zealand Parliamentary election since the adoption of universal suffrage in 1893. The 2014 result, 72.14 per cent, is the second lowest. This small increase, while welcome, is no cause for comfort. New Zealand has a serious problem with declining voter participation. Of particular concern has been the youth vote (referring to the group of voters aged 18–29), which has had significantly lower turnout than other age brackets. A graph on the Electoral Commission's website clearly demonstrates the lower turnout in younger age groups. Those from poorer and less educated demographics also fail to vote at disproportionately high rates. 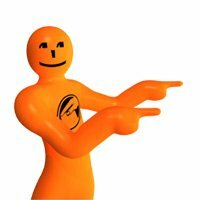 Orange Guy is the mascot used in electoral related advertising by the Electoral Commission. He is an amorphous orange blob who usually takes on a human form, but can transform into any object as the situation warrants. His face is a smiley, and his chest sports the logo of the Electoral Commission. For radio and television, he is voiced by actor John Leigh. Both the Electoral Commission logo and Orange Guy icon are trademarked to the Electoral Commission. ^ a b Palmer, Matthew (20 June 2012). "Constitution – Representative democracy and Parliament". www.teara.govt.nz. Te Ara: The Encyclopedia of New Zealand. Retrieved 5 February 2017. ^ "2017 General Election". Electoral Commission. Retrieved 5 February 2017. ^ "Kiwi PM Jacinda Ardern will be world's youngest female leader". The Sydney Morning Herald. Fairfax Media. Retrieved 20 October 2017. ^ "About the Electoral Commission". Electoral Commission. Retrieved 22 May 2018. ^ "2007 Local Elections". Elections New Zealand. Archived from the original on 20 November 2008. Retrieved 11 December 2008. ^ "Votes for Women". www.elections.org.nz. Electoral Commission New Zealand. Retrieved 5 February 2017. ^ "Enrol to vote". New Zealand Government. Retrieved 22 May 2018. ^  Archived 6 January 2009 at the Wayback Machine, Elections New Zealand, Enrolling – FAQ. Retrieved 5 April 2009. ^  Archived 14 October 2008 at the Wayback Machine Elections New Zealand, Viewing the printed electoral rolls. Retrieved 5 April 2009. ^ a b "Electoral Commission Report on the 2017 General Election". Electoral Commission. Retrieved 18 October 2018. ^ ""Term of Parliament," Section 17 of the Constitution Act 1986". Archived from the original on 18 October 2015. Retrieved 6 February 2014. ^ "Key dates in New Zealand electoral reform". Elections New Zealand. Retrieved 6 December 2011. ^ James, Colin (14 June 2011). "John Key, modest constitutional innovator". Otago Daily Times. Retrieved 27 May 2015. ^ "Local Electoral Act 2001 No 35 (as at 24 January 2009), Public Act". Parliamentary Counsel Office. Retrieved 6 June 2010. ^ "Electoral Commission". elections.org.nz. Retrieved 24 May 2018. ^ "Early voting in Northcote reaches new high". Radio New Zealand. 21 June 2018. Retrieved 18 October 2018. ^ "Voter and non-voter satisfaction survey 2008". New Zealand Electoral Commission. Archived from the original on 8 February 2013. Retrieved 5 February 2017. ^ a b "Election Day Rules for Candidates, Parties and Third Parties". New Zealand Electoral Commission. 17 September 2014. Retrieved 5 February 2017. ^ a b "MMP Voting System". Electoral Commission New Zealand. Retrieved 22 May 2018. ^ "Electoral Act 1993, 174C – Preliminary count of early votes". Government of New Zealand Parliamentary Council Office. Retrieved 15 September 2014. ^ a b "General elections 1853–2005 – dates & turnout". Elections New Zealand. Archived from the original on 27 May 2010. Retrieved 6 June 2010. ^ "Voter turnout not high despite record enrolment". NZPA. Retrieved 10 November 2008. ^ McCulloch, Craig. "Former PMs support compulsory voting in NZ". radionz.co.nz. Retrieved 23 May 2018. ^ "Non-voters in 2008 and 2011 general elections". archivestats.org.nz. Retrieved 23 May 2018. ^ "New Zealand's Famous 'Orange Guy' Gets a Makeover". Saatchi & Saatchi Asia Pacific. 23 June 2011. Archived from the original on 4 March 2016. Retrieved 5 November 2015. ^ Smith, Nick (6 August 2005). "Orange Elections Man". New Zealand Listener. Retrieved 9 March 2016. McRobie, Alan (1989). New Zealand electoral atlas. Wellington: GP Books. ISBN 9780477013840. Gibbons, Matthew (2003). An annotated bibliography of New Zealand election programmes since 1905 (PDF). Hamilton, N.Z. : Dept. of Political Science and Public Policy at the University of Waikato. ISBN 9780473097714. This page was last edited on 24 February 2019, at 23:11 (UTC).